Next day we were off to Pakse to check in at the Pakse hotel. We also visited this hotel in our last trip about 2 years ago. I remembered talking to the very helpful and friendly French manager called Jerome Lettemplier. When I checked in I asked to see the same manager again but I got a female voice replied from behind the counter who turned out to be his wife. I was very pleased that Jerome was still running the hotel as most hotel managers change hotels every few years. When I put this to him later on he told me that he and his wife own the hotel and manage it themselves. I am delighted about this additional information as this is very good news - owners who run their own hotels care about their hotel and their clients. 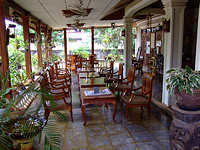 We have not had any complaints about the Pakse hotel since starting to use it for our clients over 2 years ago. I am pleased that they have renovated and improved their rooms and especially the rooftop restaurant. Jerome told me 2 years ago that it would happen and it did. 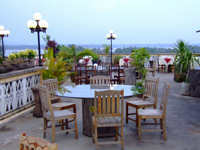 The rooftop restaurant has a panoramic view of Pakse city. Jerome invited us for dinner that night on the rooftop restaurant but unfortunately the rain came and we had to move indoors. May is the beginning of the rainy season but rain seemed to arrive early this year. I will try again in our next visit, maybe in another 2 years time. 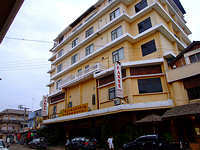 We are happy to continue using the Pakse hotel for our clients. We are also continuing to use the popular Champa Residence in our standard category. I met up with the owner and all rooms have been upgraded. That evening before our meal we went to meet our clients who had just arrived in Pakse from Cambodia that and were staying at the Champa Residence. We have met up with many of our clients who travel at the same time as us. We enjoy talking to our clients to get their thoughts and impressions. Next day we left Pakse and flew to Vientiane to visit our Laos office. We caught another flight later to Bangkok and checked in at Menam Riverside hotel agian. 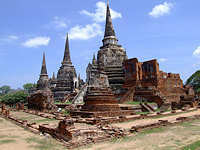 Next morning we made a day trip to visit Ayutthaya, the ruined ancient capital of Thailand. On the way we first visited the Royal Summer Palace at Bang Pa-In. It is a very pleasant visit especially in the morning walking among the pavilions, gardens and lakes with beautiful displays of flowers. We drove on to Ayuthaya. Rob and I came here about 15 years as tourists by train with our guidebooks in hand. 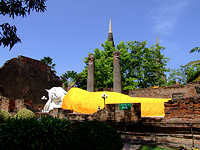 The place has now opened up with better access to the Ayuthaya Historical Park. We are very pleased that the ruins remain unchanged. This once magnificent palace and temple complex is now a Unesco World Heritage site with remains scattered around the large site. One can still feel the history and beauty that existed many years ago. You can walk around the site or cycle around it. Whatever your choice you will marvel at this magnificent historical sight. We also visited a temple nearby before leaving to catch our boat for our river cruise back to Bangkok. The river cruise takes about 3-4 hours to Bangkok including a lovely buffet lunch to start off the cruise and tea and biscuits before arriving in the late afternoon. The journey was extremely pleasant with lovely views of rural landscapes gradually changing to cityscapes as we approached Bangkok. The view can be enjoyed from the hot and sunny deck on the top or by the side of the boat or if you prefer cooler inside with air conditioning. We arrived back to Bangkok and met up with our Bangkok partners for our seafood dinner at their favorite restaurant in town before driving to the airport for the return flight to the UK. It has been a wonderful trip to both Bangkok and Laos. We enjoyed every minute of it even the wet trekking day. The rural beauty of Laos is so refreshing. The colors of green and forests still linger in my thoughts even though I have back in the UK for two weeks. I remember the forest greenery, the peaceful and relaxing river trips and most of all the friendliness and happiness of the village people and their children. I feel a smile on my face whenever the memory of the local village people comes to my head. They have brought me joy and happiness throughout my 2 week trip. I hope you will experience it yourself soon.